Santa Snail shares Mr. Claus' fashion sense, with that lovely red body fringed with white and topped with a white mantle mostly stuffed into a fine, creamy brown shell. Even the shell itself has a white lining! Detail, people. Detail. Their taste in weather is completely different, though. Not for Santa Snail the chill winds and snow of the North Pole. They much prefer the wet forests that cling to certain hills of the Western Ghats, a mountain range in India. And how can a snail travel all over the world, secretly leaving gifts for millions and billions of snails on Christmas Eve? Well, that's just the magic of Christmas! I'm with Esther, had EXACTLY the same thought! Either the snail is lazy, or suffered from 'eyes bigger than stomach' syndrome and slug just don't care. Haha! Maybe it's the equivalent of a reindeer riding on Santa Claus. 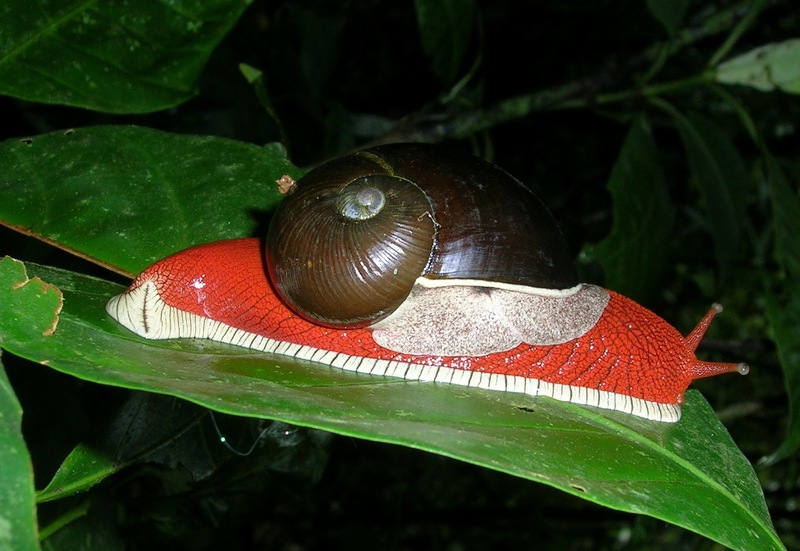 Gastropods do things differently! Ha! Why have never seen that before? I like it!